During these activities the children will observe a sandy beach scene, identify and count seashore creatures and other beach related objects. Three of the seashore creatures featured have themed activities and crafts: the crab, the sand dollar and starfish. The second activity is to visit a scene to discover and count seashells. Visit the sandy beach scene and have the children observe and identify as many objects as they can and assist them with those they don't know. Ask them how many sand dollars, starfishes, shells, crabs, beach umbrellas, beach ball, lighthouse, etc are in the scene. Write down the numbers where the children can see them. Ask the children a few simple questions about the starfish and sand dollar. How many arms/legs does the starfish have? Where is the mouth of a sand dollar?, How many legs does the crab have?, etc. This is a great opportunity to discuss characteristics of the summer season and things that we can do during the summer. Discuss the use of an umbrella to protect us from the sun. Discuss how important it is to use a sunblock product to protect our skin. Discuss water safety at the beach, rivers, lagoons and swimming pools. 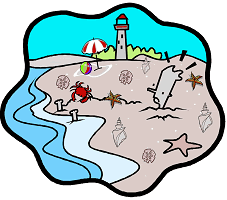 A similar sandy beach scene, with less objects is available in coloring page format to print and conduct a similar activity offline. Print the coloring page, it can be printed to light blue paper to give it a blue sky background. The children can first count and identify the sand dollars, starfishes, and shells, etc. Optional: practice scissor cutting skills by cutting around the thick black frame and then glue unto another colorful piece of construction paper. Visit the link, and have children click on the six seashells, which may be on the sand or in the sea water. Which is not a seashell? The crab.